Brendan - My name is Brendan Owens and I'm an astronomer here at the Royal Observatory, Greenwich. Graihagh - What are these beautiful pictures we're seeing right in front of us? Brendan - This is a selection from our deep space category from our Astronomy Photographer of the Year and it's a selection of star births and star deaths. Graihagh - There are some beautiful colours. I can see blues and yellows and reds. Very, very rich. Breandan - It's often one of those things that it's kind of amazing, and maybe a little bit disappointing for some people sometimes is that the colour that you see in a lot of the images is what we call false colour, so it's been coloured in. Usually the astronomers take images that are actually greyscale. Those filters are corresponding to just particular energies from particular atoms so iron, carbon, oxygen - just those things and then you can chose to colour them in. Now just to avoid confusion, we don't go all creative and colour them in whatever we want; we try and stick to a palette called the "Hubble Palette" so we all recognise what the colours are.Typically in images the reds and pinks can be hydrogen and sometimes a different shade can be neon as well. If you have something like oxygen; green or blue. You can change them a little bit but, strictly speaking, trying to keep it to the different palettes that we all understand. Graihagh - OK I'm with you now. So how do we get from these beautiful clouds of dust of atoms to what we know today as our solar system; our Sun; planets rotating around the sun? Brendan - So if we rewind the clock back to where do we go from, something has to trigger the collapse of the gas. One cause often is a supernova explosion from another star nearby which triggers the collapse of the gas, gravity pulls in clumps of gas together and that starts to swirl and heat up. It's a bit like when you take an ice skater spinning with their arms open and then when they bring their arms in they spin faster. When you get that you're getting a squeezing and squeezing of gases. A dense gas in the middle and it gets hotter and hotter so eventually, after a few million years, the star ignites so to speak, it starts getting to a temperature where it can fuse hydrogen into helium and start the process of a new star, but you'll get a dusty doughnut around it so all the heavier elements are starting to clump together into the planets. Graihagh - Now that we have our star, the rest of our solar system can begin to take shape... and weirdly enough, what happens next in the story of our solar system is incredibly similar to when you combine water, washing up liquid and pepper together. Join Brendan and I in our experiment -I'll give you a couple of seconds [interlude music like in elevator]... ok ready? Brendan - The grains by themselves are quite small but we can see they're actually clumping together to form the early planets. Graihagh - How would that happen in real life? How would they start to creep together? Brendan - This is one of the best bits about this demonstration is they actually do clump together before gravity can take over, before they're big enough to have enough gravitational pull to pull in material, they actually do stick, they're smashing against each other. Everything is quite hot at this time as well so things are far more malleable than we think of them today as in rocks, so more things are molten. Graihagh - We have, we have... there's at least 20 or thirty there. Brendan - And this is actually pretty good because before everything settles down into the solar system we're familiar with today, there's a lot of material flying around and smashing into each other. But before all this can happen, before you can have the great bombardment era, there's a bit of clear up job that's performed by our early star - the Sun. It's what we call a teatteri star and it's a young star that's got very powerful stellar winds. Every now and again we'll get what we call solar storms. 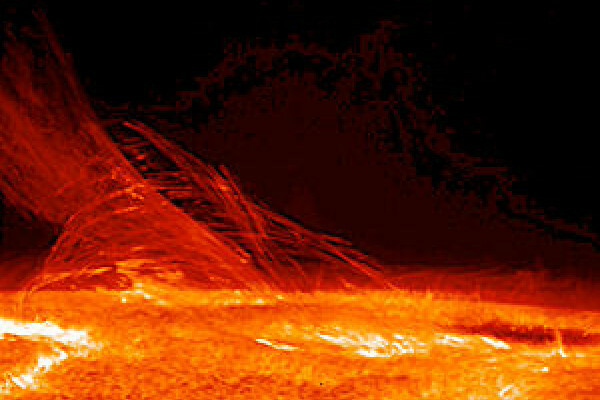 The gas from the sun; material being ripped off; these explosions that come towards the Earth and across the solar system, but it was much worse back in the early days of our Sun. Graihagh - I'm very ready... OK.
Graihagh - Pop a bit of washing up liquid on your finger and dip it gently into the middle of the bowel of water and pepper... Did you see it? It's pretty quick but all the clumps of pepper have shot out from their random distribution in the water, right to the edges of the bowl. There wasn't one planetesimal left in our bowl but then how did Earth, Mars, Venus etc form? Brendan - It's a little bit exaggerated. It's not as catastrophic because in reality you should be left behind with the biggest pieces; the most stable planetesimals, big chunks. But what it's doing in this time as the planets are forming these stellar winds are clearing out excess gas and dust. Basically they're putting a stop to any further formation. Graihagh - When the solar wind pushed out everything, I'm assuming lots of debris got smashed more into these planetesimals and they grew bigger and bigger. So at what point would they have reached the size we know them to be? Brendan - So we reckon we're talking about a 100 million years or so before you end up with substantially big chunks that we call the 'oligarch era'. So it's a time when you've got bigger pieces there floating around. The young stellar winds would have helped combine some of the smaller objects. But once you've got these big oligarchs, the big hitters in the solar system, then they're still flying around and they then take over to sort of finalise the last stages of forming the planets. So it's in times like this when you have collisions like the ones that formed the moon. So yes, things have settled down, the strong stellar winds have cleared out the more free floating dust and gas and left behind the big hitters that slowly slowed down, and everything cooled down and we eventually have what we consider our solar system today. We also think that there might have been an extra gas joined in there at some point. With planets moving around the young Sun, if they're in sequence with each other. If you have say one orbit of an outside planet, it's the same as two orbits of the next planet in. If they align with each other, they give a gravitational kick to the next planet out. So we think we may actually have a lost brother of the solar system flying off - what we call a rogue planet. Graihagh - Is that a bit like a comet? Will it come back eventually or is it just gone forever? Brendan - It may be gone forever depending on the kick it's got. Our closest star is about four light years away but that's just in one direction so, if it went off in another direction, it's going to have a much longer journey to join up with a new planet system. There is an idea as well that planets possibly can be captured by another star system. TSo thi is really speculation - the theoretical area of things but there are theories out there that state that it is possible. Graihagh - So is there any chance there might be a planet in our solar system that might be from another star? Brendan - I think when we come to planets they're maybe further out. Not even planets, I should say dwarf planets. We may have captured something else from another system so there may be one of those like Pluto that doesn't belong originally to u, which would be quite, quite amazing. I think it would be quite difficult to find out if that's the case. Graihagh - So what sort of timescale are we talking about from that initial collapse all the way to what we have today. How do snowflakes maintain symmetry? Will Curiosity Have the Longevity of Voyager I?